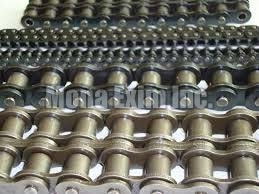 Situated in Mumbai, we have established a strong foothold in the domestic and international markets as the Manufacturer, Supplier and Exporter of the Transmission Chains. Our adept team resorts to the utilization of graded materials and au courant techniques to make the Transmission Chains that are in tune with the industry stated standards. These precise and durable Transmission Chains are procurable from us in ample specifications, at the market-leading prices.